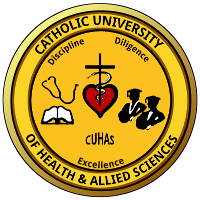 The Catholic University of Health and Allied Sciences is pleased to invite applications from qualified candidatesvwho completed either form IV or form VI or candidates with equivalent qualifications wishing to pursue studies in Diploma and degree programmes for the academic year 2018/19. ADMISSION REQUIREMENTS FOR BACHELOR PROGRAMMES. Three principal passes in Physics, Chemistry and Biology with minimum entry of 8 points. Whereby one must have at least C grade in Chemistry and Biology and at least D grade in Physics. Certificate of Secondary Education Examination (CSEE) with at least Five (5) passes including two credit passes in Chemistry and Biology and a D grade in Physics PLUS Diploma in Clinical Medicine with an average of “B+’’ or GPA of 3.5 OR BSc (lower second) majoring in Physics/Mathematics, Chemistry, Biology /Zoology. Three principal passes in Chemistry, Biology and either Physics or Mathematics or Nutrition with a minimum of 6 points. Whereby one must have at least C grade in Chemistry and at least D grade in Biology and E grade in Physics or Mathematics or Nutrition.